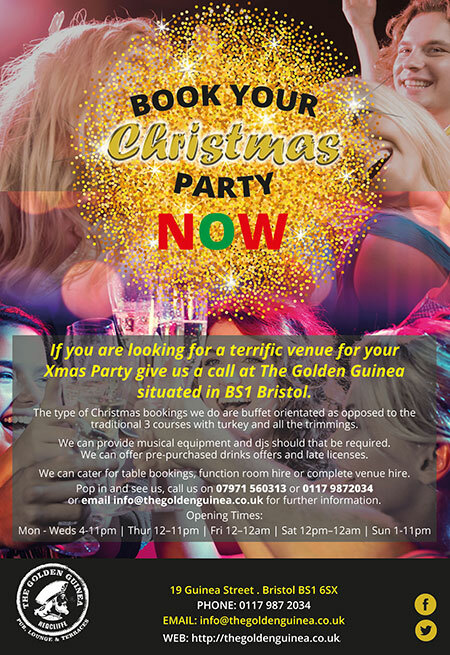 If you are looking for a terrific venue for your Xmas Party give us a call at The Golden Guinea situated in BS1 Bristol. The type of Christmas bookings we do are buffet orientated as opposed to the traditional 3 courses with turkey and all the trimmings. We can provide musical equipment and djs should that be required. We can offer pre-purchased drinks offers and late licenses. We can cater for table bookings, function room hire or complete venue hire.